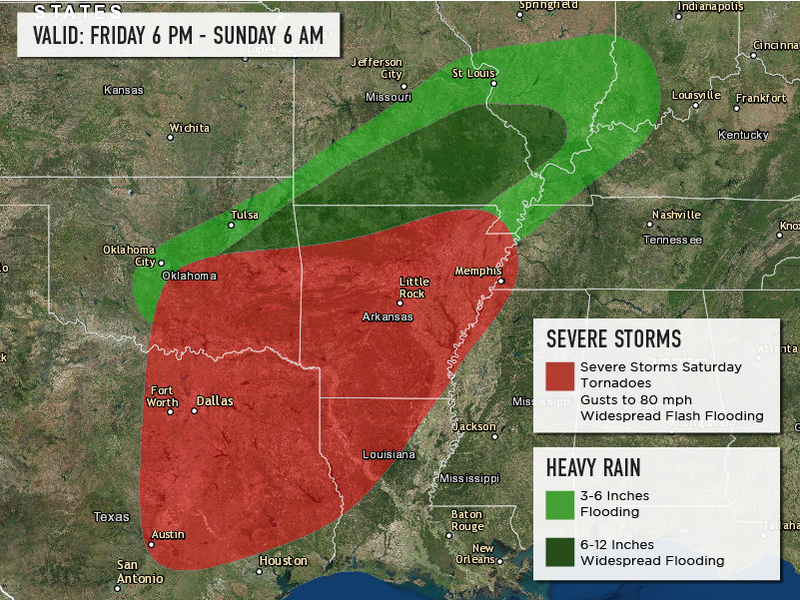 Severe weather and widespread flooding is expected across the Plains and Mississippi Valley this weekend. The main threats from this weather event will be tornadoes, wind gusts to 80 mph, large hail, and widespread flooding. Some of your properties are in the storm's path and are at an increased risk of damage. If you are in need of our services please call the MediGroup Emergency SRM Hotline: 888.243.5760. Widespread thunderstorms, some of which will be severe, will break out Friday evening into Friday night across the eastern half of Oklahoma, Arkansas, southern Missouri, and southern Illinois producing torrential rainfall across the region. This rain will continue through the overnight hours of Friday into Saturday morning. On Saturday, severe weather will develop from central Oklahoma and central Texas, spreading northeastward into the middle Mississippi Valley by early Sunday morning. The main threats will be tornadoes, wind gusts to 80 mph, large hail, and widespread flooding. While a few strong and long lived tornadoes are expected over the event, there is a major threat for extensive flooding especially from far eastern Oklahoma into the Ozarks of Missouri and Arkansas as well as far southern Illinois, where up to 12 inches of rain is expected. Significant disruptions to logistical operations are expected, with long lived power outages, structural damage to homes and businesses, road closures, washouts along railroad track, and major river flooding.